Odaban Spray 30 ml order online. ODABAN Sprayis gentle and effective, offering 24-hour protection for most areas of the body. ODABAN's unique, hermetically sealed pump spray helps prevent product degradation and its precise and constant dose avoids over application. Providing too much is, in fact, one of the main reasons why antiperspirants can be irritating to the skin. Whether making an important business presentation or holding hands on a date, no matter the ambient temperature, ODABAN will bring you freedom to concentrate, and of course, a new found confidence. Odaban is suitable for all skin types and through its unique formula there is less chance of skin irritation than other products. Odaban is very easy to use. Only apply Odaban before bedtime on very dry skin, remember: "Less is more". 1 to 2 sprays on the center of the armpits is sufficient. Odaban is suitable for all skin types and its unique formula gives Odaban less chance of skin irritation than other products. Odaban is very easy to use. Odaban only make bedtime on very dry skin, remember: "Less is more." 1 to 2 sprays in the center of the arms is sufficient. ODABAN contains a tried and tested formulation of 20% aluminium chloride in a silicone and pure alcohol base. The product is subject to stringent quality and production controls that guarantee user satisfaction. ODABAN is suitable for all skin types and with its unique formulation and packaging delivers a suitable amount to help protect against excessive sweating without undue irritation. Odaban spray is intended for external use on intact skin. Can be used during pregnancy. 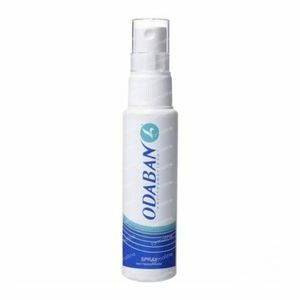 Odaban Spray is an effective product against excessive sweating. One should really read the instructions and apply them correctly. On dry skin at night before bed, max 2 sprays. After 3 days you may repeat this again. And you won't have malodorous armpits. Amazing. With this word, this product can be described. Unrivaled and can absolutely not be compared with traditional deodorants. This product helps! Hello, I'm going to tell the truth, I'm very happy that I ordered this product, it arrived fast and well the transport was in good conditions, in a word, satisfied !!! !